Focaccia di Recco was a must try for my vacation in Liguria. It's one of those specialities that I heard about for very long and never got round to try, since you can only have it in Recco. Liguria is very famous for its Focaccia Genovese, which I blogged about in a couple of previous posts, and you might think of Focaccia di Recco as a variation of that. Wrong. 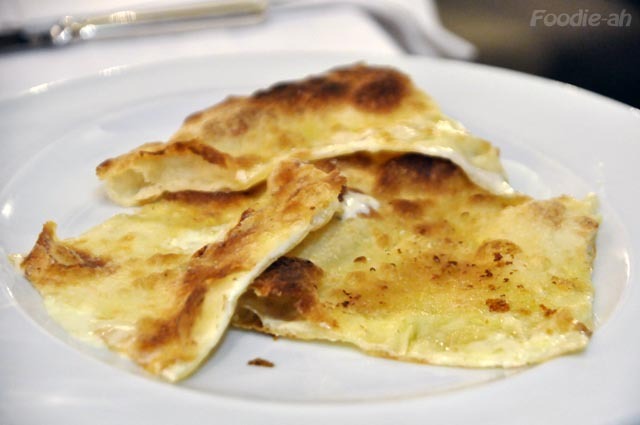 Focaccia di Recco is totally different. In actual fact, you shouldn't even think of it as a focaccia, besides the fact that they are both flat breads. 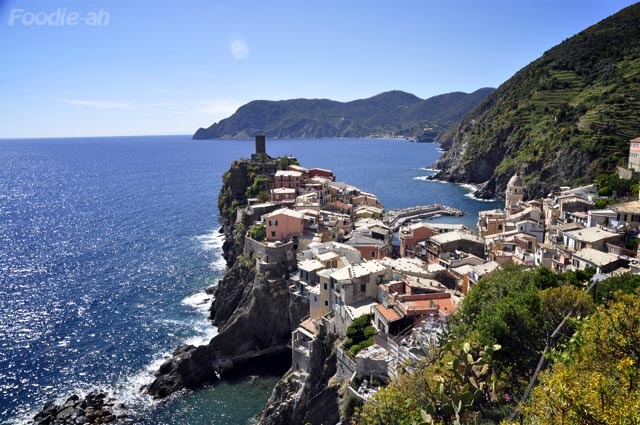 We were visiting Cinque Terre, with its long, steep walks and breathtaking views of tiny villages miraculously built onto the rocks. 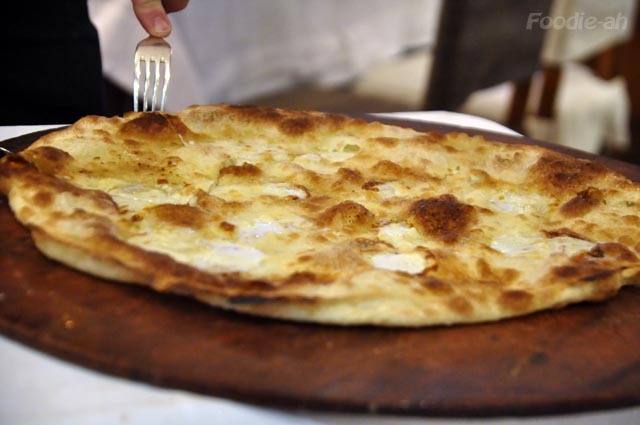 Recco is only a few miles distance from there, and we decided to try Focaccia at Manuelina, which besides being the most reputable place to try this focaccia, is also a great restaurant with one fork on the Gambero Rosso guide. The restaurant is located just off the exit from the motorway, and it was extremely easy to find. Right at the entrance, there was a large brass emblem stating "Authentic Focaccia di Recco", to officialise the fact that there you can have the "real thing". There are in fact many places in Recco and its surrounding where you can have this type of focaccia, but of incomparable quality, to the point that you could call it a fake focaccia :) This is one of those incredibly simple dishes, so simple that it's very difficult to make properly. 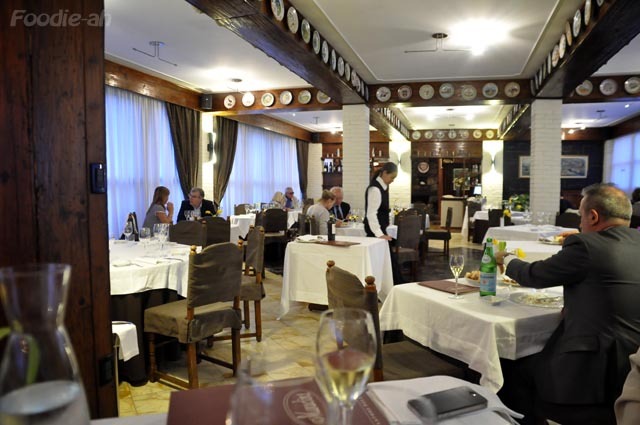 The restaurant has a beautiful dining room, warm and classic, and displays the most impeccable service that we encountered during our trip in Italy. As we sat down at our table, we were served a complimentary glass of prosecco, and a few slices of crispy bread. There were many interesting options on the menu, but without a doubt, the set menu was a must try, for 58 EUR per person. When they came with the appetiser, a real focaccia di Recco, we were terrified. The focaccia came on a trolley, laid on a wooden board, and it was probably 50-60cm in diameter, or in any case of a size that would have been sufficient for two people to eat and be fully satisfied. I initially thought we were going to be given a couple of slices and share the rest with other diners, but well... no, it was all for us! It is hard to describe the beauty of this focaccia, golden and crispy, with craters of bubbling fresh cheese that erupts from the inside. As our waiter Emilio started to cut across it, the noise confirmed the first impression, of a flat bread that's paper-thin and crispy throughout. We were served three slices each, and the rest of the focaccia was left next to us, to continue to tempt us as we tasted the initial portion. This was without a doubt one of the best breads we had in our lifetime, but we were most inclined to think that it was the best. It was heavenly. The delicate crispiness, the softness and flavour of the cheese flowing from the inside. Unprecedented. It was with great regret that after eating the initial portion, and having an additional couple of slices, we had to leave a good quarter of the focaccia back to the waiter not to waste the rest of 5-course meal that was going to be served. 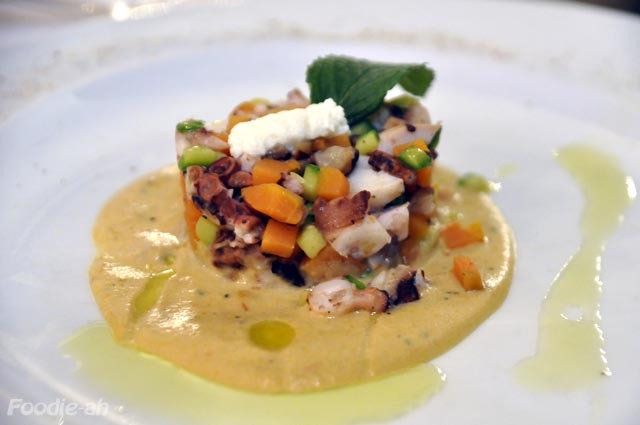 The 'Polpo, brunoise di verdure e prescinseua su vellutata di melanzane' was an octopus salad with chopped vegetables and prescinseua cheese (the same one that is used for the focaccia) on an aubergine pureé. The flavours were subtle and the sauce nicely brought them together. Less impressive was the 'Carpaccio di ricciola affumicato con pepe rosa e sale affumicato'. 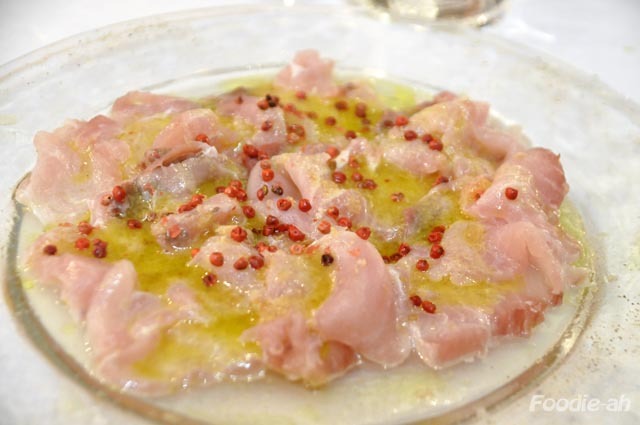 A carpaccio of amberjack, with pink peppercorns and smoked salt. The portion was huge and the fish was great, but the intense acidity of the sauce killed the delicate, tender fish. Finding the balance in salt and acidity on fish carpaccio is not simple, and it's not the first time I come across this problem. 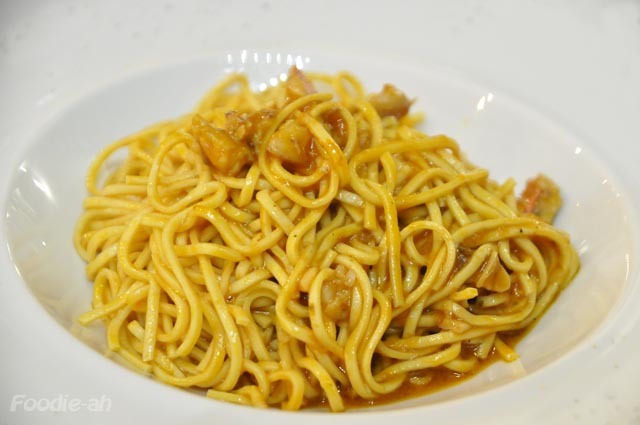 The meal was re-lifted by the 'Taglierini alle triglie di scoglio', which was a tagliolini with red mullet. The pasta had a good bite, and the flavour of red mullet was very distinct in the sauce. Well executed. 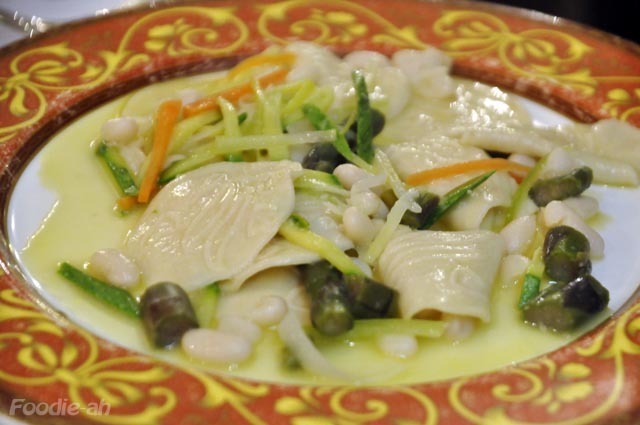 The 'Corzetti dei Fieschi all'ortolana' was a Corzetti pasta dish with a vegetables sauce. Steering away from the classic recipes, this was a more delicate and refined but tasty sauce. The best of all dishes (leaving the focaccia aside) was this 'Pescatricie in sfoglia di melanzane su vellutata di pomodoro'. 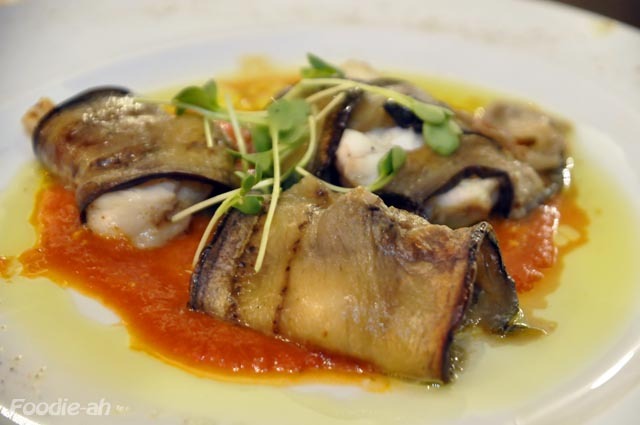 The rich meat of Monkfish was wrapped in tasty grilled aubergines, on a bed of mild tomato velvety sauce. This was our favourite overall, with an indisputably Italian combination of ingredients, and all the right flavours. The second main dish was a 'Fagottino di branzino in pasta Fillo con farcia di scampi'. 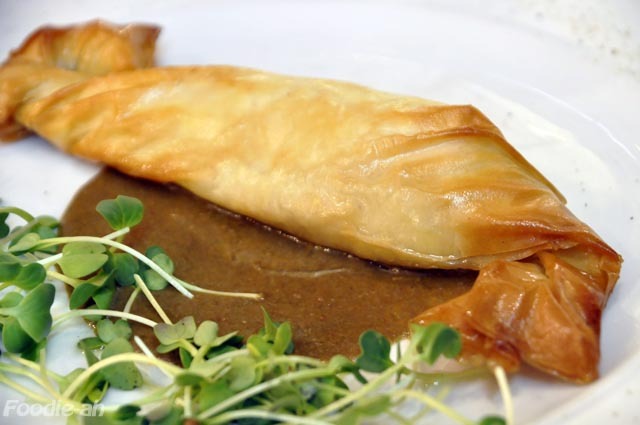 Essentially a seabass with minced scampi, wrapped in filo pastry. This was also very good, and most notably the flavour of the scampi really added an extra kick to a seabass which has great texture, but is normally very plain tastewise. Despite how good it was, I was unable to finish this dish since every portion of this tasting menu was a full portion, in true Italian style. Unfortunately (or fortunately, perhaps), I am not used to eating at this rate, and I felt rather overwhelmed by the amount of food. The fought of having a dessert at that point was dreadful, and our waiter advised to wait 15 minutes or so, to recover. So we did, and went ahead with the desserts. 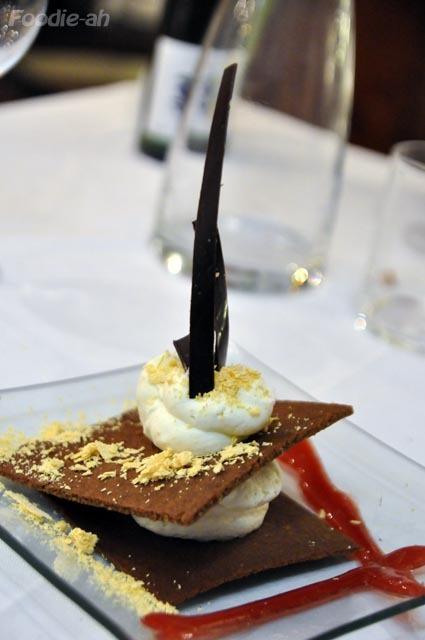 Very good overall and quite classic, with a creamy/chocolaty dessert, and an orange creme bruleé. 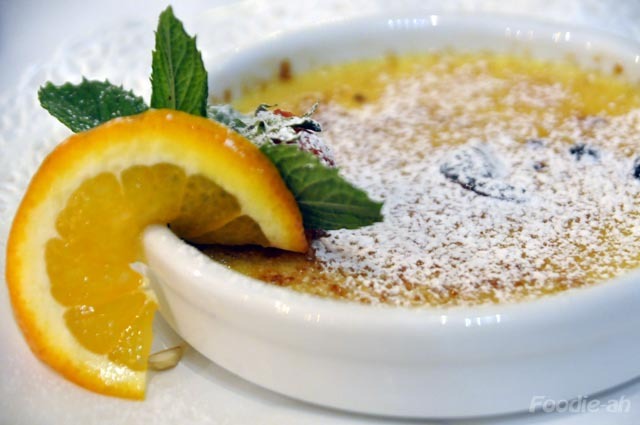 Unless you have a very capable stomach you will struggle a bit with the full set menu, and in that case I would recommend ordering a la carte. We managed in the end without too much wastage, but the food is so good that every bit left uneaten feels like a real pity. 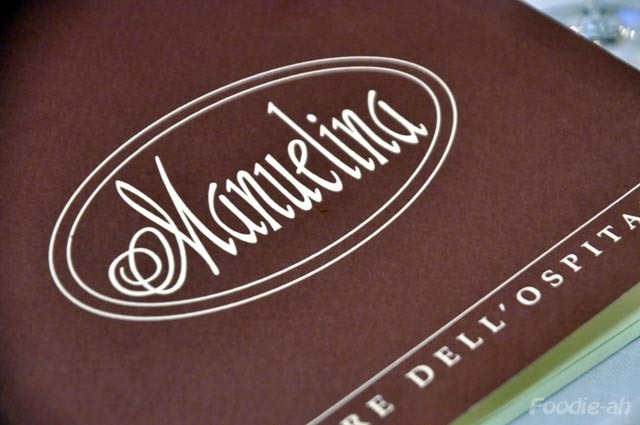 Manuelina is a must-visit if you are in the area: great Ligurian food, exceptional service and cozy setting made it a very pleasant evening for us. The focaccia is unmissable. There is a focacceria next door, where you can buy and eat exactly the same focaccia if you are not game for a full meal. However, the food at the restaurant is well worth the full experience. Thank you for sharing. I'm enjoying the meals vicariously. I am Content and Community Manager at Travelavenue.com, the new community travel guide. I am very happy to tell you that our editorial team has selected your blog to be part of our program “Travelavenue Favorite Blog 2011”. Could you please send me your email address, so that I can send you additional information regarding our program?